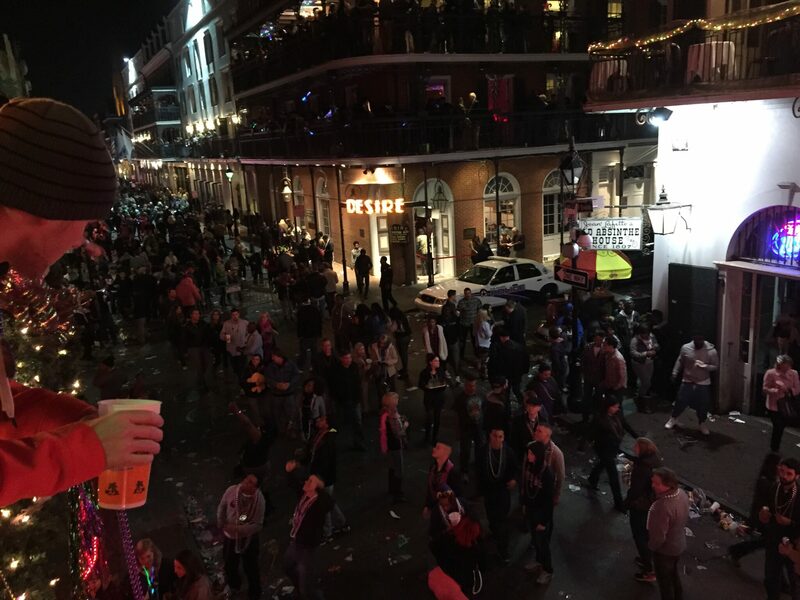 New Orleans is magic. I can’t land in New Orleans and not become immediately energized, excited, and free from any concerns that existed upon boarding the plane that carried me there, even if said plane is the second one I’ve boarded that day, because the first one turned around and went back to Atlanta after having major mechanical problems, causing the flight attendants to ask one another if they packed a change of underpants when they were sure no passengers could hear them walking off the jetway. I don’t care if I’d only been there last month, I love going again. 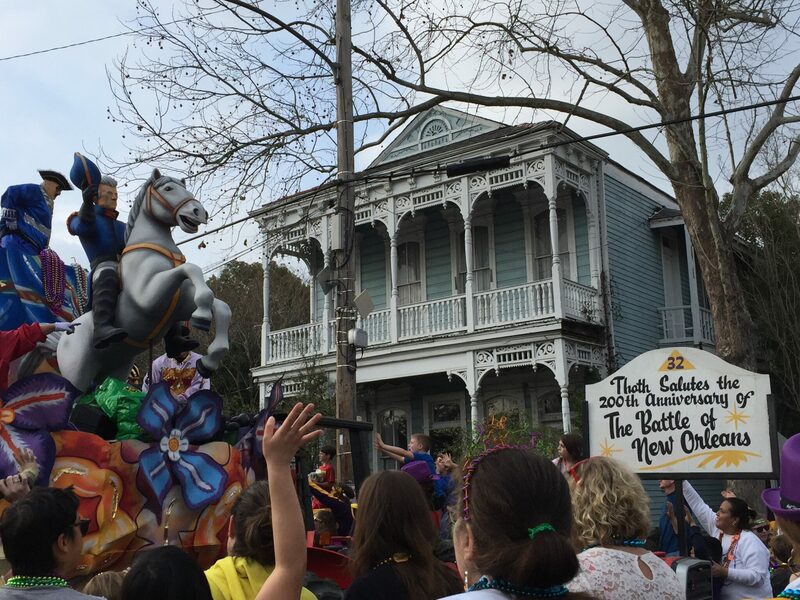 Last weekend was my 19th visit and my 7th Mardi Gras (6th consecutive). 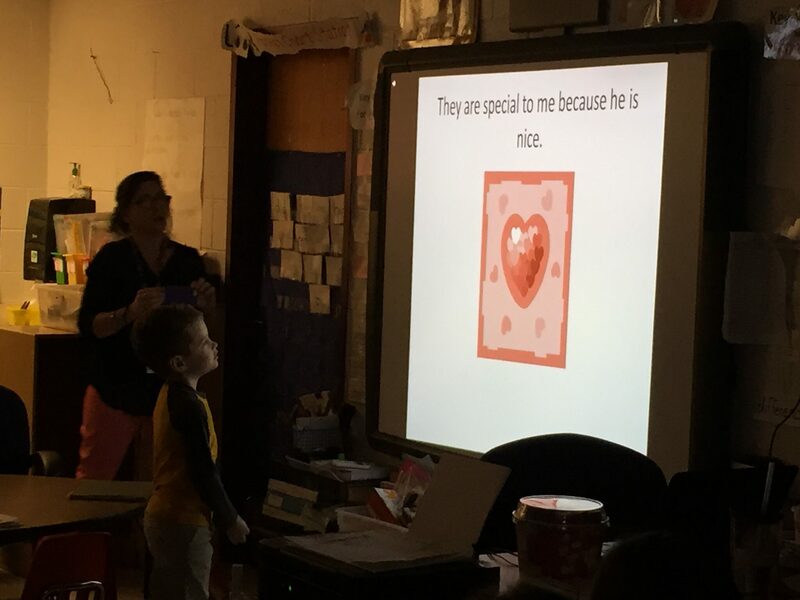 The morning of the flight began with my 6-year-old boy’s inviting me to his kindergarten class for “VIP Day,” which meant he made a brief powerpoint presentation about me and why he chose me. It included the assertion that I know how to fly a plane, which is interesting, since I don’t (I took a few flying lessons in ROTC during undergrad but would probably fare more poorly than Ted Striker did after the rest of the crew ate the fish if really pushed to land a jumbo jet). I assume he thinks I can because I take flights pretty often. Once I made it, my friends and I checked into the hotel and headed to Coop’s Place for some Cajun fried chicken, and it was delicious. We then spent some time at Port of Call before hitting Pat O’Brien’s (where most of the rest of the attorneys from our conference were meeting us) and then enjoyed dinner at Dickie Brennan’s Steakhouse before a party at Pier 424 and my singing karaoke at Cat’s Meow before closing the evening down on Frenchmen Street at a couple live music venues around 3am. The next morning, I checked into my conference, saw some old friends, got a bit of legal learning, and then led a couple newbies down to Port of Call for some damned fine burgers. A visit to Bourbon Cowboy followed, and dinner was at Sylvain, followed by going to the Napoleon House and Saints & Sinners before returning to our Frenchmen Street favorites; we then stopped by The Alibi before returning to the hotel at 5:45am. Saturday morning, a couple of us had breakfast at Yo Mama’s Bar & Grill before one of us flew home, and I took a cab to the lakeside area to meet my bride and children. At this point, the trip shifted gears a bit. A friend of mine from my Air Force Reserves days named Lauren was gracious enough to allow my family to stay with hers, as my room at the Ritz was set to nearly double in price Saturday night. 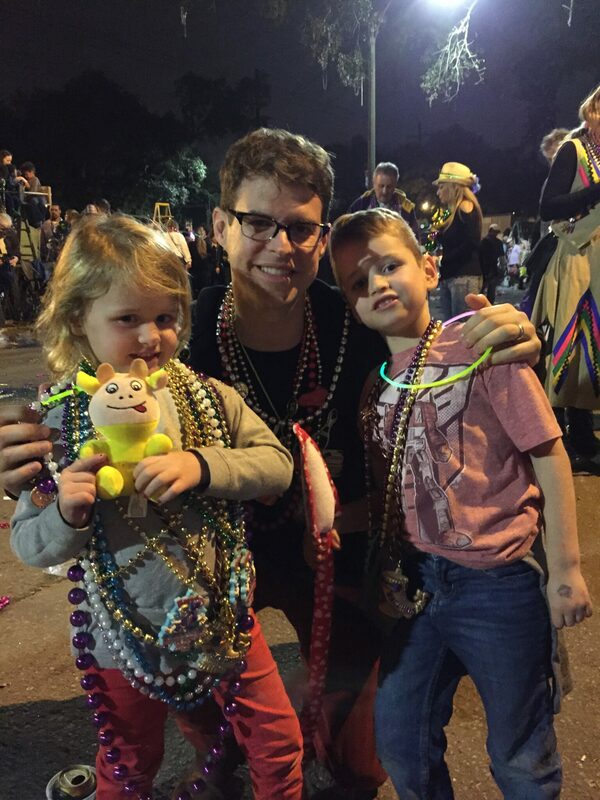 We went to Endymion. 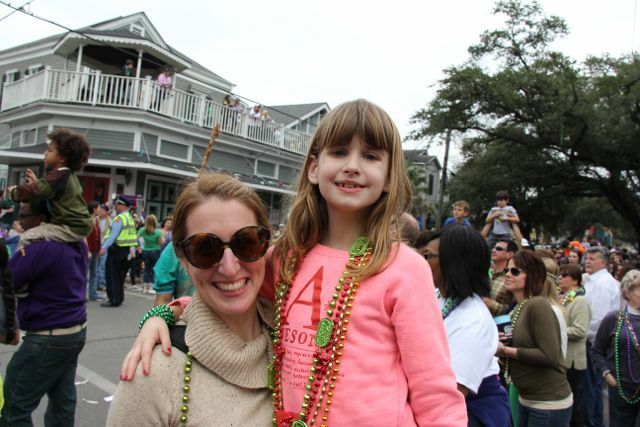 After a long walk across the City Park, we approached the area in Mid-City where we were to see the parade. 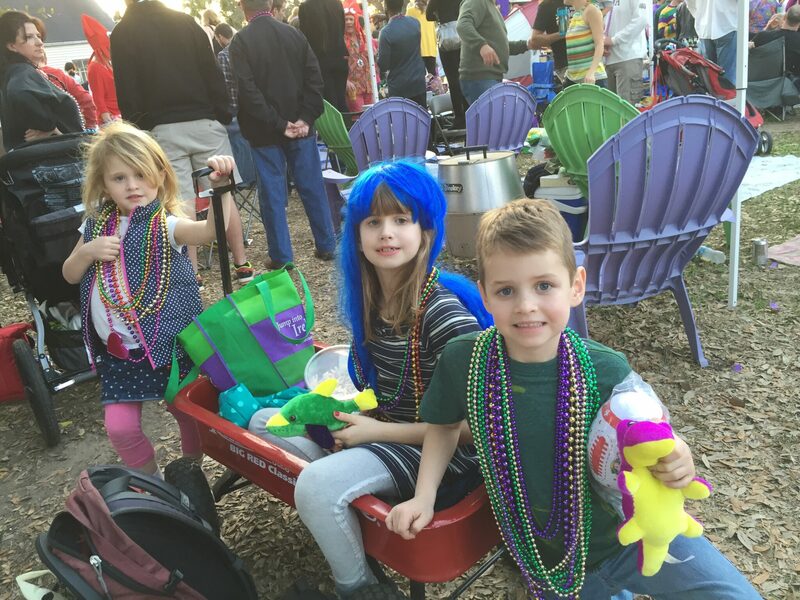 I immediately regretted the “crazy” (to quote a few folks I’d told of my idea to take my small children to Mardi Gras) decision to bring the babies down. It was packed, and when we walked up toward the front of the crowds to get against the barricades and let the kids see the floats up close, the clearly intoxicated folks who were near told me “things here are about to get rowdy” and “you really shouldn’t have children up here.” I just stared at them and gave an “Okay,” because I was tired. A half hour later, another one gave the same sentiment, and since it was getting dark (and the children had caught some things by this time), we made our way back from the hordes a bit. We went home, had pizza delivered from Papa John’s, and went to bed (my bride and I included) by 8:30pm, as all of us (especially me) were exhausted. 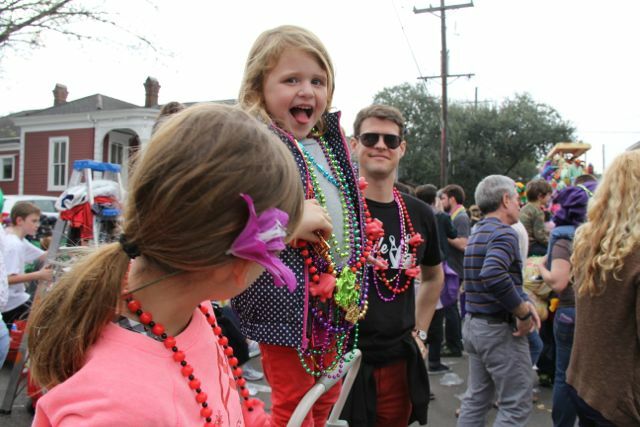 The next day, we headed uptown to a friend of Lauren’s home off Magazine, where we saw Okeanos, Mid-City, Thoth, and Bacchus. It was one of the most fun days I’ve ever had as a dad. Right up there with Disneyworld. 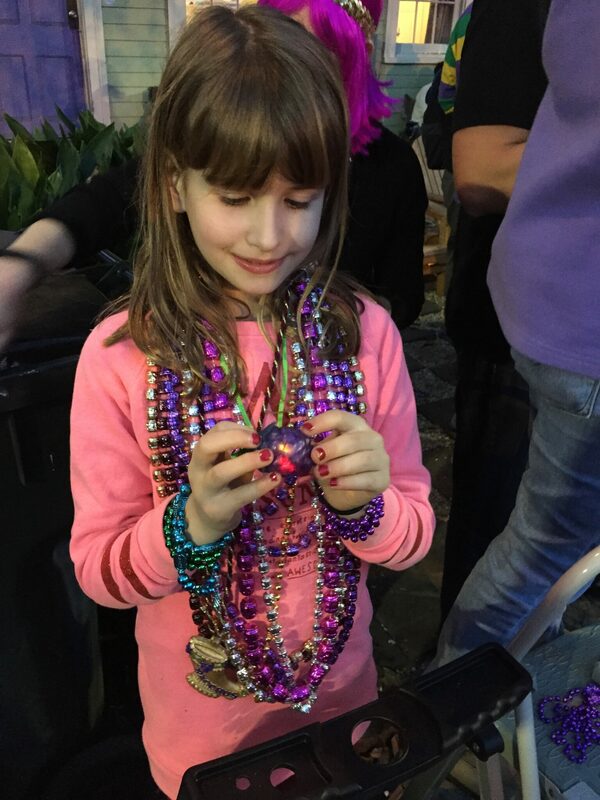 The children loved seeing the parades, catching the throws, talking to Lauren’s boys and the other children, and enjoying the energy and festive aura that is New Orleans on Mardi Gras weekend. I even saved an elderly woman from buying a can of Four Loko under the mistaken belief that it was “just like Mike’s Hard Lemonade” while on a beer run. But in spite of all that, my boy badly wanted a spear. 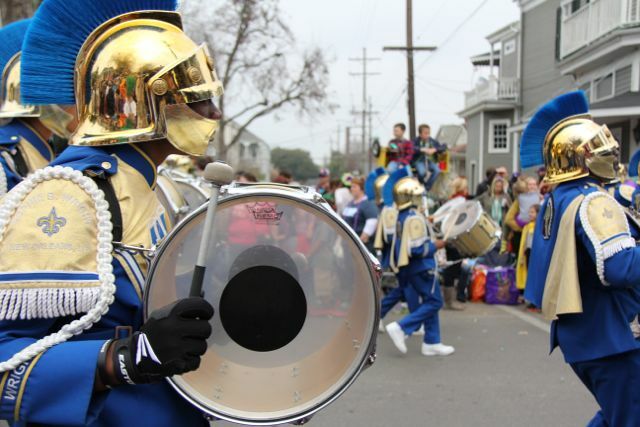 As he collected footballs, stuffed animals, beads, lights, swords, and coins, he still pursued a spear with every passing float at every passing parade. I’ve never seen him be that tenacious about anything in his 6 years on our planet. 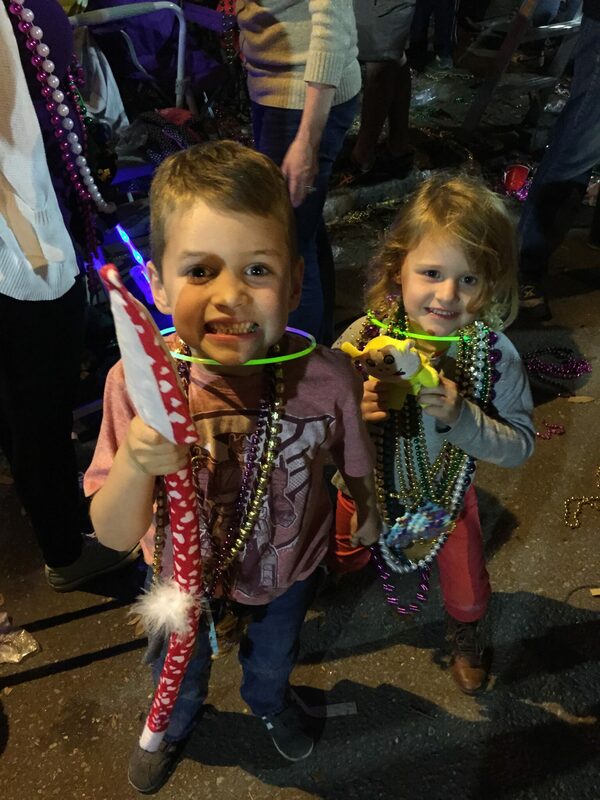 After seeing the kids’ stories theme at Bacchus, led by king John C. Reilly and followed by the likes of Harry Potter, Charlotte (of web fame), Jack (of bean stalk fame), Mother Goose, and the King Kong family, he was losing hope in getting his coveted stuffed spear. 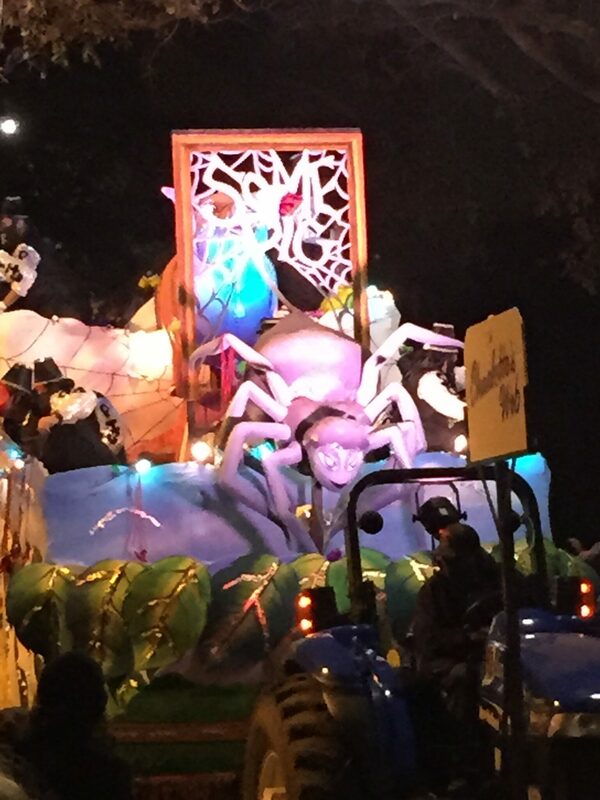 And then…with only 2 floats left, it happened. My boy caught a spear. It was red with white hearts all over it (after all, the preceding day was Valentine’s Day), and he loved it. 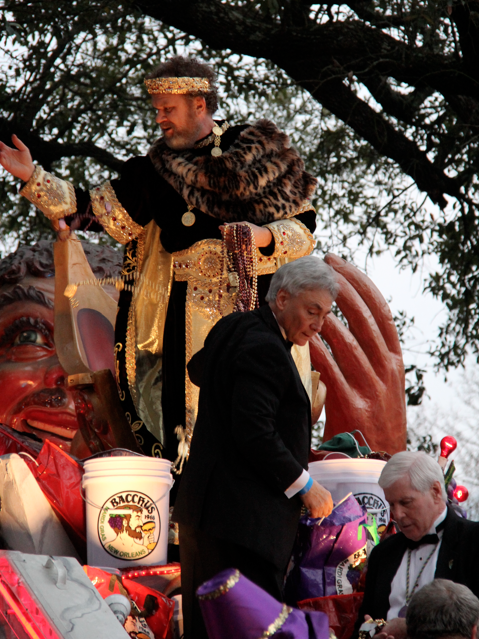 It actually took him a several seconds to realize he’d caught it, considering how many hours (days, in fact) he’d been yelling “SPEAR!” at every passing float. 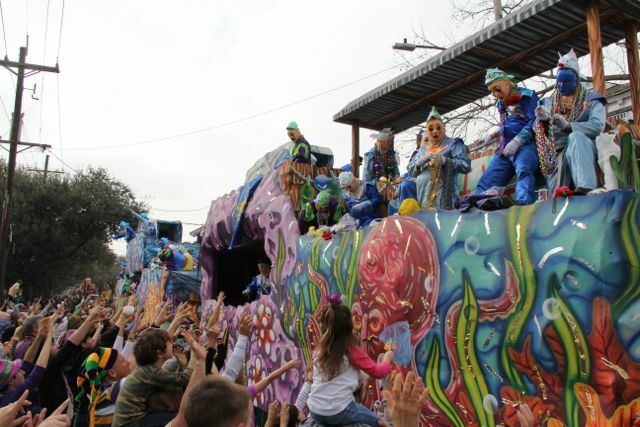 He then changed his chant to “THANK YOU SO MUCH!” as the float continued down the road. He slept with the spear that night. He carried it with him to the WWII museum* the next day and sat with it for the 6+ hour drive home after lunch at Borgne. It was the highlight of a trip he’d already enjoyed, as had the rest of the family. As we packed to leave Lauren’s house on Monday, he told her sons he’d see them next year, as he and his sisters were certain they wanted to go back and could hardly wait for the opportunity to do so. 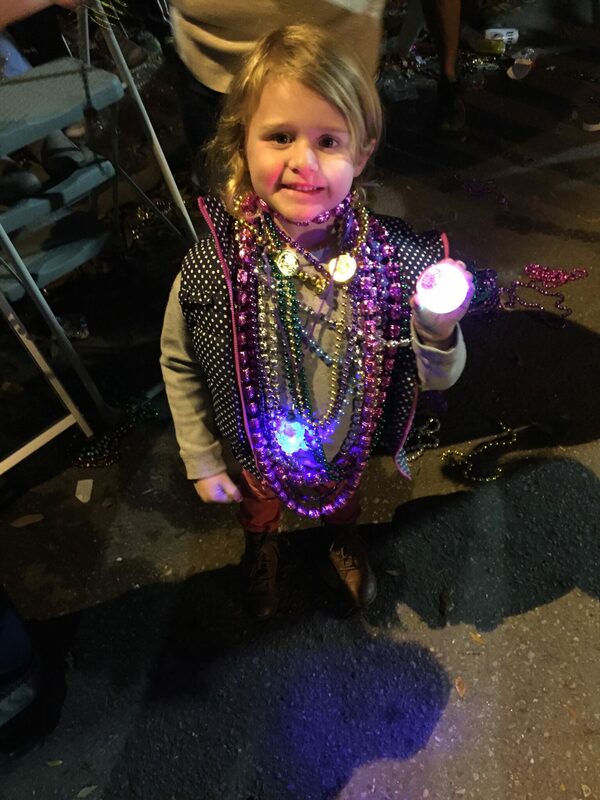 I’m not sure I’ll take the children every year that I attend my annual conference at Mardi Gras, but we’ll definitely go again. 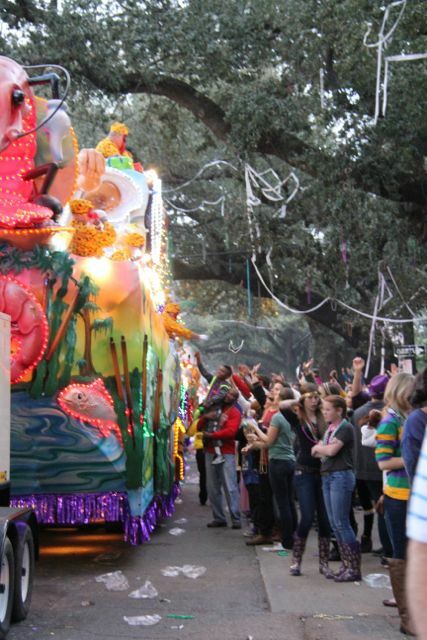 We’ll probably skip Endymion and just see the uptown daytime parades again (but include Bacchus Sunday night, of course). All 5 of us absolutely loved it. The fact that it was Valentine’s Day weekend and Presidents Day weekend (meaning no school Monday) made it an easy decision this year. It was exhausting, but awesome. One of my top parenting decisions. 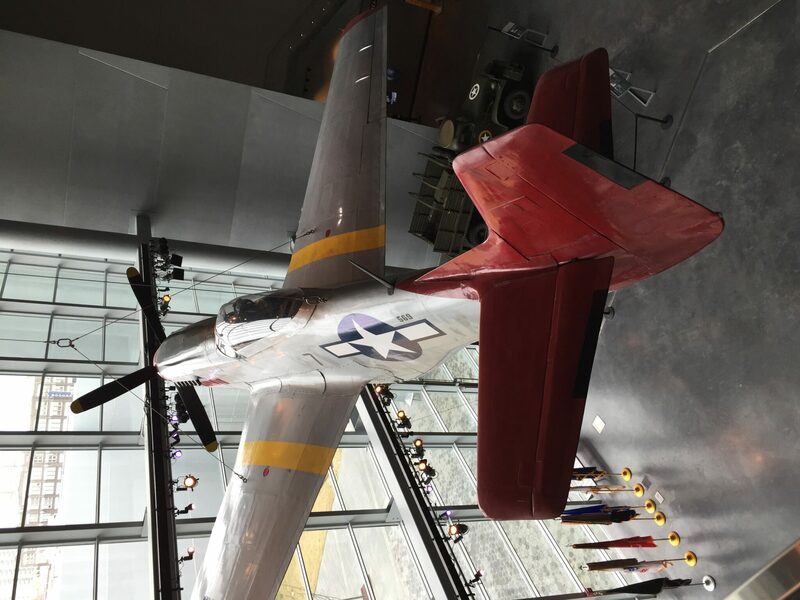 *I would not recommend taking a 4, 6, and 8-year-old to the “Beyond All Boundaries” film at the WWII museum. I worry we have scarred our children indefinitely by showing them violent, 4-D scenes from war and the Holocaust. Oops. A good visit to one of my favorite cities! It was awesome. So was the WWII film, but I did not *feel* awesome as I sat with my children feeling the silent judgment of the other museum-goers. It still smarts a little, actually.